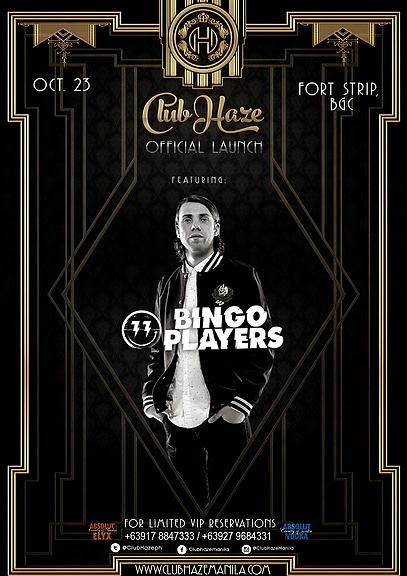 Club Haze Official Launch Featuring Bingo Players - Hello! Welcome to my blog! Yes, it's been more than a year in the making. It took us that long to perfect everything for you and to find the right formula!Where Luxury meets Clubbing, waltz your way into a NEW HAZE! Sexier, sophisticated, sinfully decadent! Sure to entice your taste to an Ultimate Luxurious Clubbing Experience! Limited tickets will be available at the door: Php1000, inclusive of 2 cocktails. For limited VIP tables call / text: 09178847333 This is your new era. This is the era of HAZE!